Molds are designed using 3d solids technology. 3d solid design produces a computer model of the mold that is easy to understand and review before the tool build. With E-drawing viewing software, we can provide a 3d solid model of the mold that is viewable on any computer. The 3d model also simplifies the task of assuring that interferences between mold actions and the molding press are eliminated. 2d drawings are produced from the 3d model data and a parametric link is maintained so that the drawings are automatically updated when a change is made to the design. We can take your part data and create a 3d core and cavity model that can be used for CNC programming or finish the mold design in-house. We can take your part model and evaluate the geometry for conditions that could result in problems for mold design and part production. We will assess the part for backdraft, undercuts, thin and thick wall section, as well as suggesting possible design changes that will improve the part molding process. We will create a basic 2d preliminary mold design for the purpose of including the drawings in a tool build quote package. The preliminary layout will insure that each build quote received is based on the same basic requirements for mold size and required mold actions. We can create a 3d solid model from a 2d part print. Our mold design experience provides us the opportunity to model in draft and shutoff features for optimum tool design. 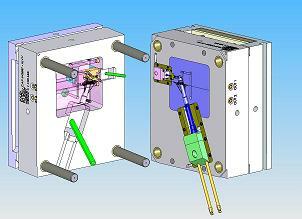 We have experience designing single cavity short-run proto-type molds with removable hand-load inserts. We have the capability to provide a computer generated flow analysis for the plastic part. The analysis can provide feedback that will aid the tool design with cooling and vent placement. The analysis will also verify that the proper gate size and location is designed to meet molding requirements.